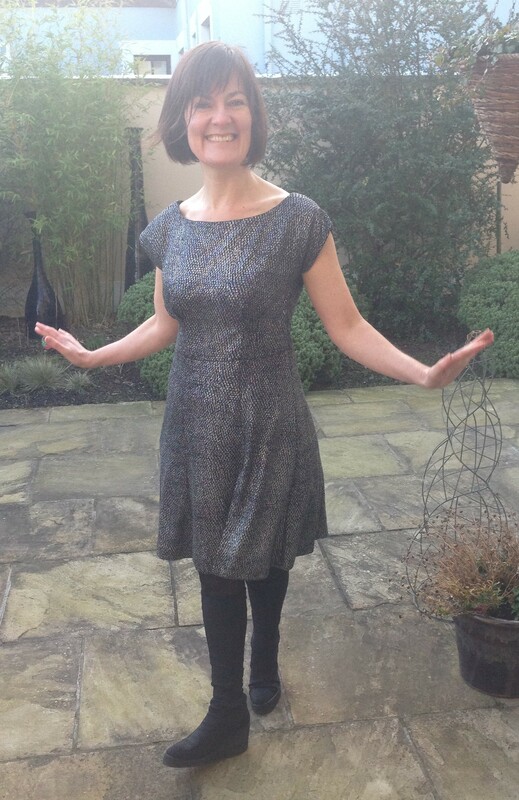 My ambitious plan was to make this Anna dress on New Year’s Eve and wear it to a party that night. The sewing bee contestants could do that four hour turnaround time no problem. Me? Nope. Just two months later.. here it is. I got the fabric in one of my favourite London haunts – the bargain basement of Misan on Berwick Street. It cost £25 for 3 metres. 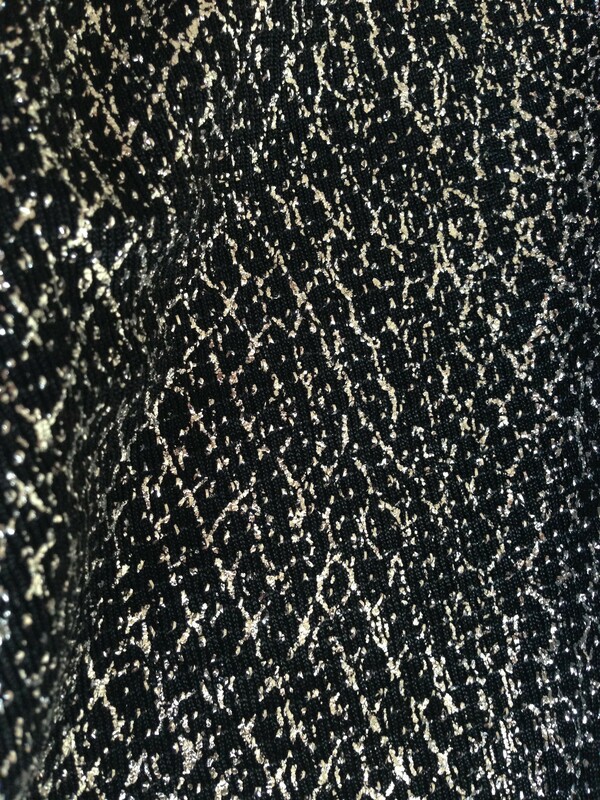 This fabric was always destined for party frockdom, It’s wonderfully sparkly, shimmery and fun. It falls beautifully and I love the metal threading. Before embarking on a slinky Anna I looked online to see other people’s experiences of using the pattern with a stretch fabric. No disasters. Excellent. 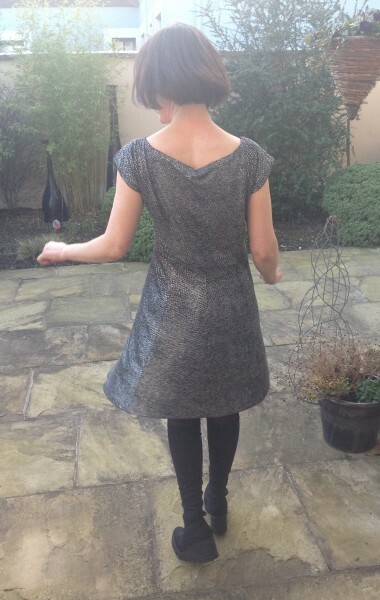 Because I like the smooth finish you get from a full lining – well, mainly because it’s a way to avoid facings – I decided to fully line the dress with stretch mesh. It would have been better not to throw this second slippy, stretchy beast to the mix. That hard truth emerged several hours into what became a challenging sew. 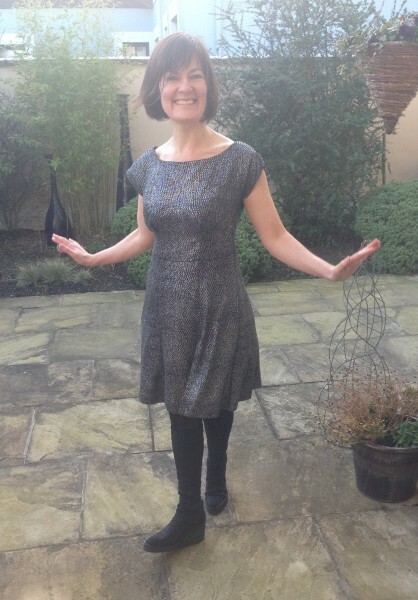 Double the stretch, double the fabric’s tendency to pucker and wave… I sewed and ripped the sleeve hem three times. And that was just the sleeve hem. The overlocker refused to engage in the project at all. When I started overlocking, the machine screeched and spat out one of its needles. It seems that metal threading comes at a price. 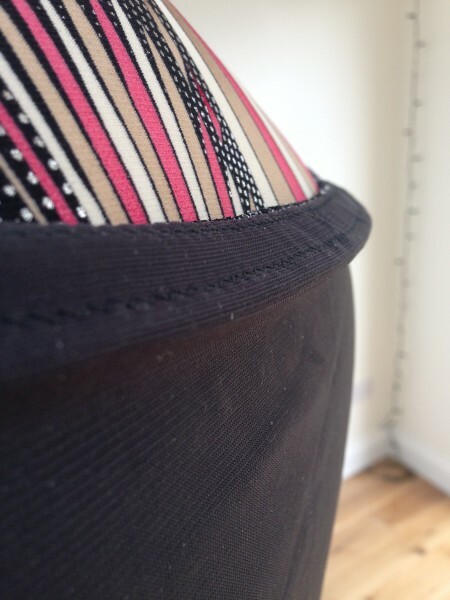 On the plus side – the major benefit of stretch is a wonderful fit and this was no different. It’s also very forgiving of uneven seams and cutting errors! The dress sits lower in the back than the front, I’m guessing because the fabric has so much stretch. It may very well stretch more over time. I figure I can hem afresh if it happens. Handy then that I didn’t actually hem it at all… I just tacked it in place. 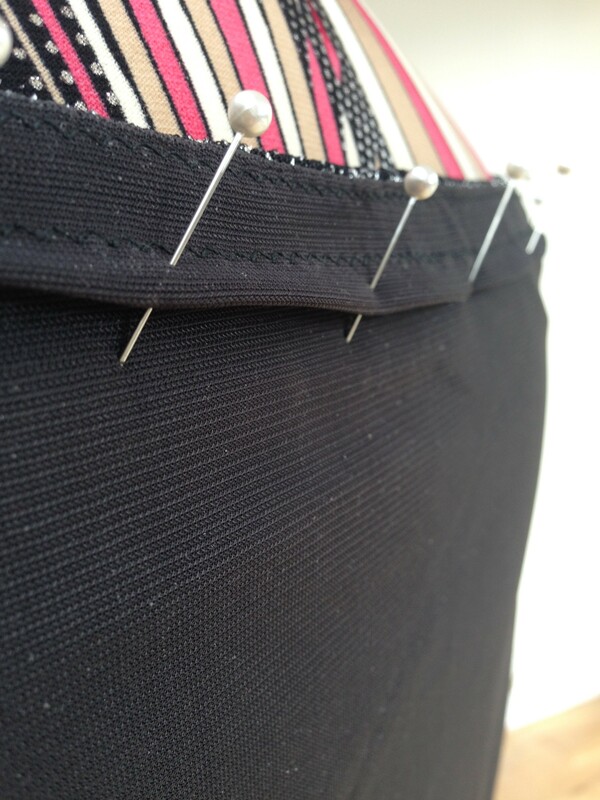 I was running to a dinner deadline and tacking was soooo much faster than hemming. 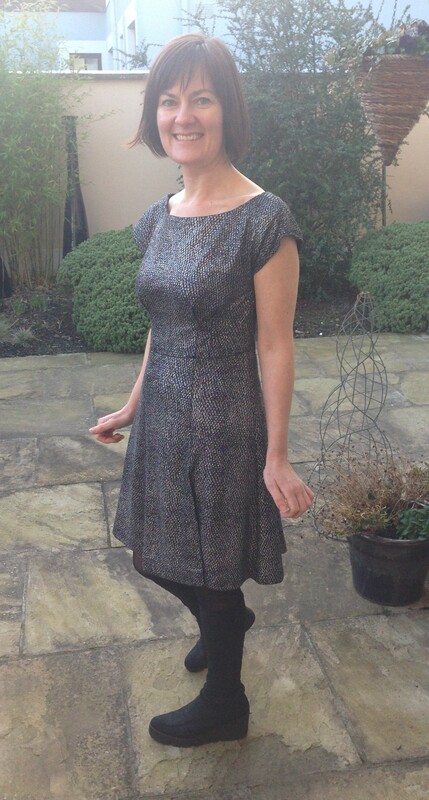 I intended hemming it properly at the next sewing opportunity but by then I had moved on to another project. Shucks. 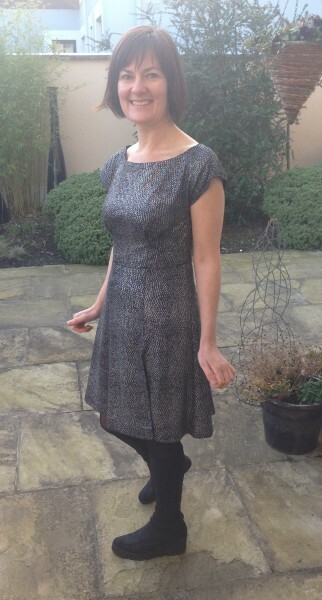 Another problem that took ages to fix was the drag on the dress caused by the smaller lining. Fabric and lining were both cut the same size but the stretch disconnect meant that the lining was smaller. This meant that the lining spoiled the line of the dress in places. I did some quick fixes but the neckline was particularly badly affected. 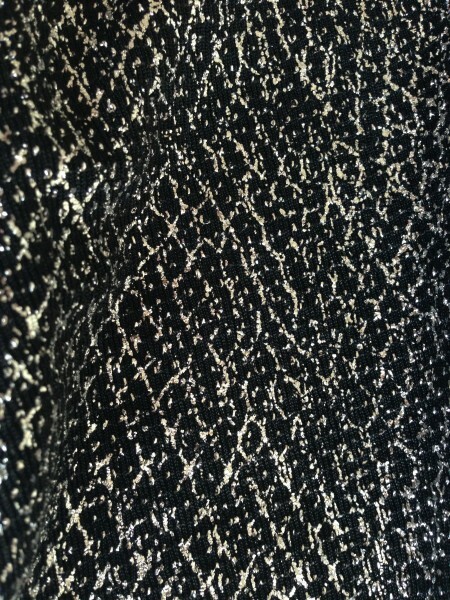 This is the dress inside out on Coco. Chopping into the front and back and adding panels for ease seemed the only way. 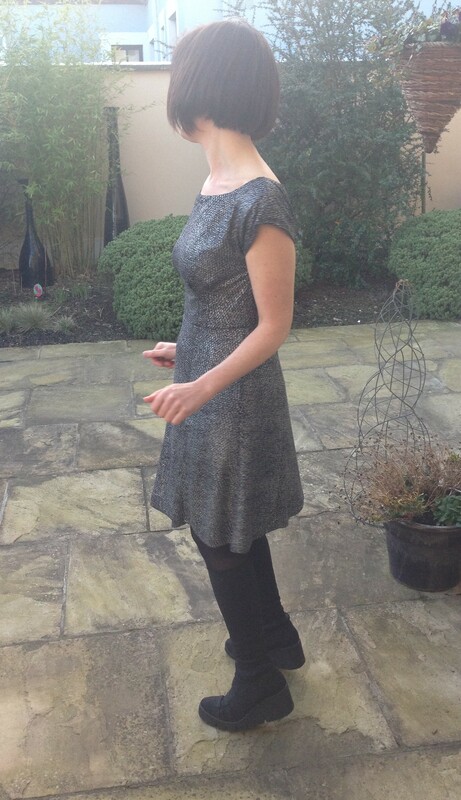 Then I tried pinning the lining to itself to match the curve of the dress. And – hey presto. It worked. An independent observer might consider the joy that followed exaggerated. The amateur sewer needs no convincing. I love this dress. The pattern is great too – simple and easy to follow. I used the online tutorial instead of the booklet. I liked the pictures (!) and the chatty tone. The shape of the dress is lovely and the slit is a surprising twist. I wouldn’t be brave enough for a thigh high split in the summer but you can pretty much get away with anything with opaque tights. I made a couple of pattern adjustments. Taking a chance that there’d be enough stretch to accommodate a pullover dress, I sewed the back bodice and back centre skirt pieces in the fold, factoring out the seam allowance. It worked well. I would definitely make another Anna. I absolutely love the result. I’d probaby wear almost anything in this fabric! The fact that it’s a great dress is – well – a nice bonus. 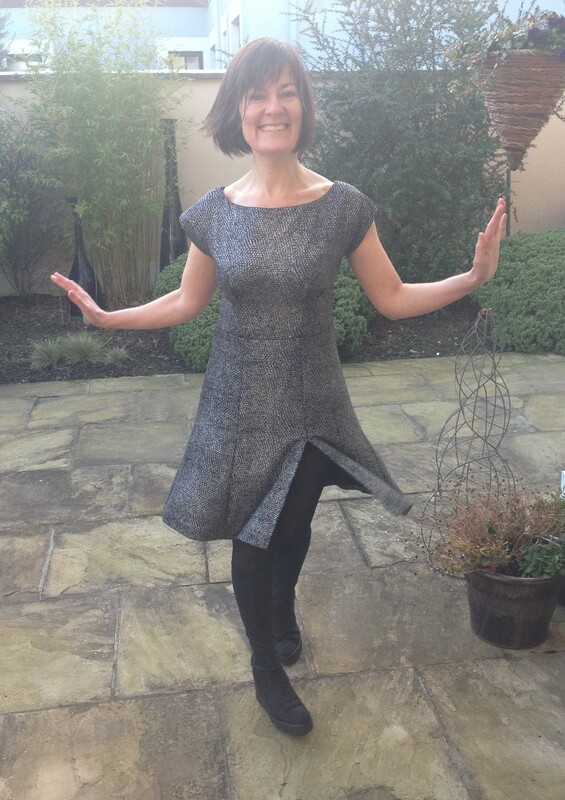 And now for a twirl. This entry was posted in Uncategorized by Sinead. Bookmark the permalink.